Let us know (as a comment on this blog post) and we'll enter your name into a drawing for a $20 gift card to WalMart from SitterCity. We have five cards to give. Let's share all our ideas and help military families be financially ready families. Did you recently PCS? Need to explore new child care options? 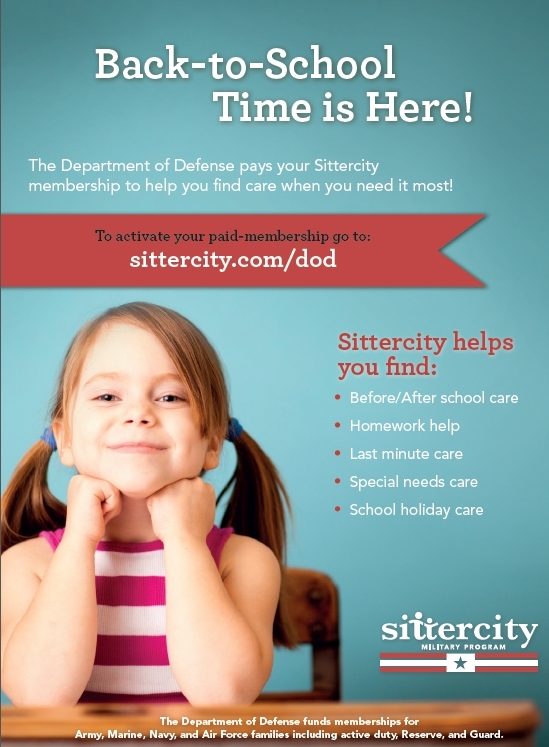 Be sure to use your free membership from the DoD to SitterCity (for Army, Navy, Marine and Air Force families). Thank you SitterCity for supporting out Military Families. I've been shopping the clearance racks for back to school clothes. Also, this weekend is the tax free holiday in my state so that's a good time to shop. I try to re-use some school supplies if I can. This year I am re-using my son's lunchbox, pencil box and plastic folders. I also try to shop after the school year has started when things start going on clearance. Shop early and shop sales online with free shipping option and cashback sites. i only buy what is on sale! Thanks for a super giveaway! I shop around,compare prices, thrift stores, and garage sales. I use, reuse and recycle my kids school supplies from last year. Goodwill and other second had shops. Also, I scan craigslist and the "freecycle" board throughout the year for school supplies. Free binders and notebooks abound. I save money by buying supplies when they are on sale. I buy clothes throughout the year to keep from having to do it all at once. Thanks. This year we are looking for the best sales. We are also going to try and reuse supplies from last year that are in good condition! To save money this time of year, I sort through our past school supplies stash first before shopping for new items, then I watch the commercials and sales fliers for the best prices on school supplies. I go through closets to see what I've stocked up on that I don't have to buy again, reuse what is still in good shape, and watch the sale flyers and buy when school supplies are on a great sale. In order to save money, I use coupons, shop the clearance racks, and go through our old school supplies before buying new ones. Oftentimes my son brings home enough at the end of the year to knock out at least half of the new school years list. I save money by clipping coupons and shopping deals..but I also recycle my money by having yard sales and house sales were I sale old and gentlely used clothes and shoes.I also buy in bulk. I try to buy used as much as possible. We use coupons and shop sales. Only bought one backpack this year since our daughter's was still like new. I save money in the long run by never using a credit card. When I am out of money, well, I just don't buy anything else. It's funny what you think you can't do without until you try. I also dug out all old odds and ends of school supplies and you know, we actually have a ton of perfectly good paper, pencils, and glue sticks. I will also buy second hand uniforms and cook from scratch more rather than eating out or buying prepackaged meals. We can eat for several days on chicken or meatloaf and fresh vegetables on what we'd spend for one big dinner out, and it's healthier as well. We PCS every year...so my oldest who is happy with his backpack, is using it again for the 5th year in a row!! AND it was a hand me down from a favorite cousin!! I also don't buy everything on the required school supply list. Show me a 6th grader who actually uses 10 (yes TEN) glue sticks in a year, and I'll show you a wasteful child who needs to figure out how to make less go farther!! My son is being sent in with 2 glue sticks and instructions to tell me when he needs replacement sticks! Once the kids go back to school, most stores will clearance out a lot of their school supplies. I stock up on supplies for the following school year. I can usually get pens, pads, pencils, and stuff like that for about ten cents a pack! If we happen to run out of something during the year, we always have plenty on hand to replenish. If not, we are well stocked for the next school year! I shop the sales rack for clothings and stock up on basic school supplies when on sale. Shop the clearance racks and use coupons when available. I also go through our leftover school supplies. After separating colored pencils, regular pencils, checking markers, etc, I realize we still have a lot of usable supplies. Also, I like to get large binders from thrift shops. Shopping sales and Wal Mart for the remainder. Coupons, tax free weekend, and only buying what's truly necessary.